Be our hero! 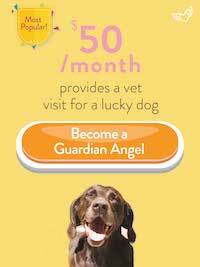 Become a Guardian Angel! 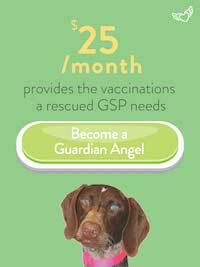 With your recurring monthly donation, you’ll make sure that funds are available to take care of our current and incoming foster GSPs all year long. Your generosity means we can truly help those GSPs that have more extensive medical needs! No amount is too small or too large! Click a pre-set amount above, or Choose Your Amount from the pull-down menu and click the button. Need a custom amount? Email us! Use your bank’s online banking or bill pay system – send to NorCal GSP Rescue, PO Box 933, Menlo Park, CA 94026 and note Guardian Angel in the memo or account field. Or sign up through your employer’s workplace giving program. Use our dedicated page on Network for Good. Low tech? Mark your calendar and mail us a check each month yourself! Have questions or need help? Email us and we’ll do our best! 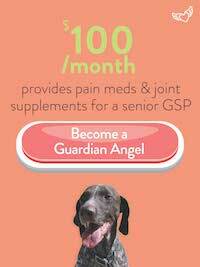 Give the gift of a second chance to a deserving GSP! Help us celebrate 20 years of saving GSPs and join us in making the next 20 years even better! Sign up today to save more GSPs in the years ahead! and provide life-saving care to GSPs in need!